Malaysia can be the next launch pad for a pool of world talented technopreneurs and have its own Silicon Valley success stories with i-City's new status as a technopreneur campus. I-Berhad, developer of the RM2 billion i-City project in Shah Alam, Selangor, obtained approval from the government in May to turn the project into a technopreneur campus. It thus has potential to attract talents not only from Malaysia, but also from across the region. i-City, which is now 20 per cent completed, is a 29ha project that boasts broadband speed of 20Mbps, with a fibre-optic network and a back-up power supply. I-Berhad deputy chairman and controlling shareholder Tan Sri Lim Kim Hong said under the technopreneur campus concept, i-City will be a "gated but open" international zone. 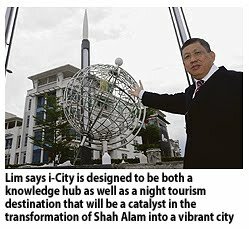 "This zoning is in recognition of i-City as both a knowledge hub as well as a night tourism destination that will be a catalyst in the transformation of Shah Alam into a vibrant city," he said. Apart from having a technologically-advanced state-of-the-art infrastructure, Lim said i-City also focuses on other elements of the Silicon Valley-like ecosystem. This includes developing the entrepreneurial talent pool, organising programmes to connect entrepreneurs and technopreneurs with venture capital partners and getting universities to play a higher level of support for industries. "They (technopreneurs) have the business model and technology but may not be relevant in this market. We try to match them with venture capitalists," he told Business Times in Shah Alam, Selangor, recently. Lim, an old hand in Malaysia's corporate sector, said the technopreneur campus concept has its roots in the campuses of many of the world's leading knowledge companies such as Google campus and Microsoft campus. He said these campuses are enclaves where the offices and supporting facilities of these companies are located. Lim said for i-City, the technopreneur campus status is seen as a formal recognition of what is already in place. "The approval also included a number of programmes and activities that will enhance the value of the development such as cultural and night tourism activities, a boutique hotel, an Islamic financial hub and plug-and-play technopreneur development centre," he said. I-Berhad expects to complete other developments such as the Cybercentre office suites during the second phase, which is expected to kick off by year-end. It also plans to build office towers and a one million-sq ft shopping mall in future phases. Malaysia's largest property developer by sales aims to launch its RM6 billion KL Eco City project in Kuala Lumpur by December. SP Setia Bhd, the country's largest property developer by sales, is targeting to launch its much-talked-about KL Eco City, a RM6 billion project in Kuala Lumpur, by December. "We postponed the launch of KL Eco City previously because of what was happening globally. We hope this time the project will come on stream as planned," SP Setia president and chief executive officer Tan Sri Liew Kee Sin told reporters after visiting Balai Berita in Kuala Lumpur yesterday. KL Eco City, described as a green mixed development, is located opposite Mid Valley Megamall. It will be developed in three phases over some 10 years. SP Setia will build office towers, condominiums and signature offices, including an area for retail. The project is a joint venture with Kuala Lumpur City Hall (DBKL), which owns the 9.7ha leasehold land in Kampung Haji Abdullah Hukum. DBKL is partnering SP Setia on a profit-sharing basis, taking 20 per cent of the project's net profit. Liew said he was upbeat about the project, among SP Setia's biggest. "We will have a different marketing approach for KL Eco City. It will be something never done before - not by us nor any other developers in Malaysia." 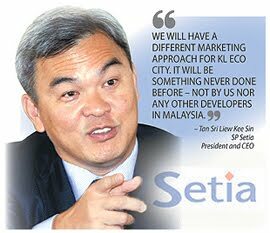 Liew also expressed optimism that SP Setia would meet its RM2 billion sales target for the fiscal year ending October 31 2010. Up to May 31 this year, it had achieved revenue of RM1.6 billion, attributed to property sales from its 10 ongoing projects in Malaysia and Vietnam. Since last year, SP Setia has launched several marketing programmes to promote sales, including its popular "5/95 home loan package", which has been emulated by other property developers, and the "Best for the Best" scheme. The latest was the "Invest in Setia Homes". SP Setia achieved its highest sales of RM1.65 billion last year in spite of the global economic turmoil. UEM Land Holdings Bhd is looking at expanding its land bank in areas like the Klang Valley, says its managing director/chief executive officer, Datuk Wan Abdullah Wan Ibrahim. "We have a serious strategy in identifying new revenue streams. We are now active in looking for land outside Nusajaya, Johor, to supplement our income," he told reporters after the company's annual general meeting here today. Wan Abdullah said the vision going forward was to make the company less Nusajaya-centric. "In order to be a national player, we must have projects not just in Nusajaya and need to have exposure elsewhere. "There are discussions currently and we have also received proposals from Penang," he said. The company currently has 3,200 hectares in Nusajaya which are yet to be developed while in Cyberjaya, it has about 39.2ha. Meanwhile, its chairman, Tan Sri Dr Ahmad Tajuddin Ali, said UEM Land expected this year to be better. Ahmad Tajuddin said the company planned to launch a new project -- Symphony Hills -- in Cyberjaya next month. "The high-end project will consist of six phases and it has an estimated gross development value (GDV) of RM1.01 billion," he said. He said the company also planned to launch 480 units of houses in Nusa Bayu project in Johor in September. "Nusa Bayu is a residential project and will consist of 4,942 houses with a GDV of RM800 million. "The project is targeted at medium- to low-income groups," he said. UEM Land's pre-tax profit for financial year ended Dec 31, 2009, rose to RM129.582 million from RM75.700 million in the same period of 2008. Its revenue, however, fell to RM403.085 million from RM511.647 million previously. SIME Darby Property Bhd has been selected the inaugural recipient of Frost & Sullivan’s 2010 Malaysia Green Builder of the Year Award for its best practices in the industry. The award looked into several categories, including commendable diligence, commitment and innovative business strategies required to advance in the global marketplace, Sime Darby said in a statement. Managing director Datuk Tunku Putra Badlishah said the award recognised the group’s continuous efforts in pursuing the sustainability agenda. The public sector and government agencies should lead the development of green buildings, rather than making it mandatory for the private sector to do such projects. Energy, Green Technology and Water Minister Datuk Seri Peter Chin said he was talking to a few other ministers on the prospect. "I am hoping that the public sector will spearhead the development of green buildings. Maybe we can start with new government hospitals or schools developed by the Public Works Department." 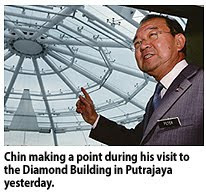 Chin spoke to reporters after visiting the Energy Commission's (EC) new "green" headquarters in Putrajaya yesterday. Called Diamond Building, the headquarters is the country's third green building after Chin's ministry's Low Energy Office and Malaysian Green Technology Corp's Green Energy Office in Bangi, Selangor. The Diamond Building is the country's first office building to be certified with the highest Green Mark Platinum environmental rating (provisionally) by Building and Construction Authority of Singapore. The EC is investing RM94 million on the eight-storey headquarters, which is said to be 46 per cent more energy-efficient than a typical office tower. Construction started in September 2007. The EC is ready to relocate and fully occupy the building from June 28 this year, the commission officials said. The Diamond Building is targeted at reducing energy usage by 65 per cent with an energy index of 85 kWh/m2 per year at 2,800 hours of use. A normal office building in Malaysia has an energy index of 250 kWh/m2 per year. HONG KONG: Sun Hung Kai Properties Ltd, the world's biggest developer by market value, paid HK$10.9 billion (HK$100 = RM42.61) for a residential site at a public auction in Hong Kong, beating estimates and underscoring that luxury home demand is withstanding government efforts to cool the market. The Ho Man Tin district site was estimated at HK$8.41 billion, according to the median of seven analysts surveyed by Bloomberg News. At HK$12,540 a square foot, it is the highest price in urban Hong Kong since its property market peaked in 1997, according to Centaline Property Agency Ltd.
Home prices have risen 41 percent since the end of 2008, prompting the government to tighten down-payment requirements for luxury homes in October to curtail speculation after record- low interest rates fueled the surge. The Hang Seng Property Index, tracking six of Hong Kong's biggest develo pers, closed 1.8 per cent higher, reversing a 0.1 per cent drop. "The above-expectations bidding price shows that the developers hold a positive outlook on urban sites for luxury homes, as currently it is obvious the supply for luxury homes is not sufficient," Wong Leung-sing, an associate director of research at Centaline, one of the city's biggest real estate agencies, said by phone yesterday. The Centa-City Index, a measure of Hong Kong's home prices, last week fell 1.44 per cent, its biggest weekly drop in over 18 months, after the government's May 12 pledge to keep boosting land supply to cool the market. Hong Kong may add as many as 60,000 homes in three to four years, Financial Secretary John Tsang said on Wednesday. The price "was not cheap but still reasonable," Fiona Wan, a spokeswoman at Sun Hung Kai, said by phone yesterday. The firm expects to invest HK$18 billion to develop the site "into a luxurious residential area." The estimates ranged from HK$7.15 billion to HK$9.8 billion. Home prices in Hong Kong rose the most among the world's major markets in the fourth quarter, property adviser Knight Frank LLP said in April. Average prices climbed almost 28 per cent from a year earlier in Hong Kong, while in China they advanced 25 per cent, a global index compiled by the London-based broker showed. They rose 3.4 per cent in the UK and fell 3.1 per cent in the US, according to the April 21 survey. Luxury home prices may rise 20 per cent this year as the economy expands and supply remains limited, real estate broker CB Richard Ellis Group Inc said in January.